How to register an ezTalks account? 1. 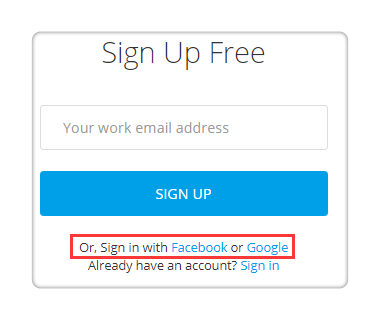 Enter your email address and click "Sign Up, It's Free". Then go to your mailbox to activate your account and complete your profile. 2. Click on login with "Google" or "Facebook" . And you will sign up successfully without email activation. Once you have registered the ezTalks account, you can click here to sign in to the user center page. Alternatively, you can download the ezTalks desktop or mobile apps, then sign in your account to schedule a meeting, start a meeting, join a meeting or add contacts. Now learn the quick start guide as host to know how ezTalks works.